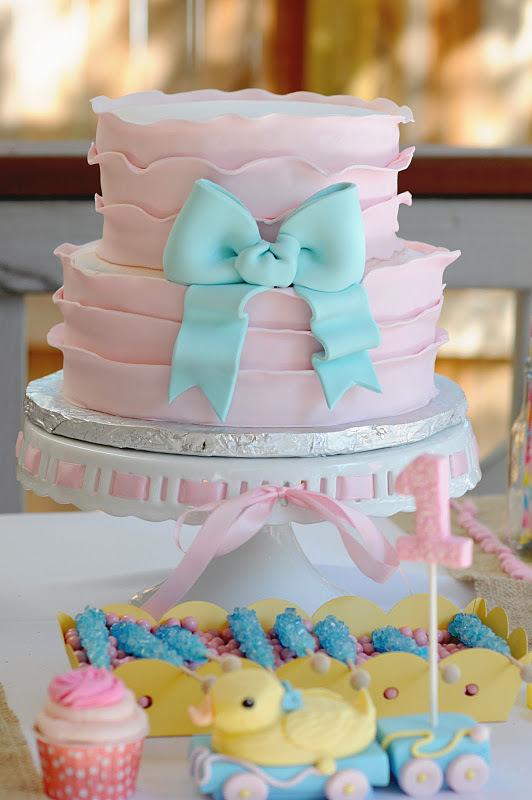 My next feature goes to this adorable RIBBONS AND BOWS 1ST BIRTHDAY PARTY submitted by Suzanne Olvey of Fanciful Events. What a charming party! LOVE the theme. I'm so surprised I've never seen it before, it's so perfect for a little girl! 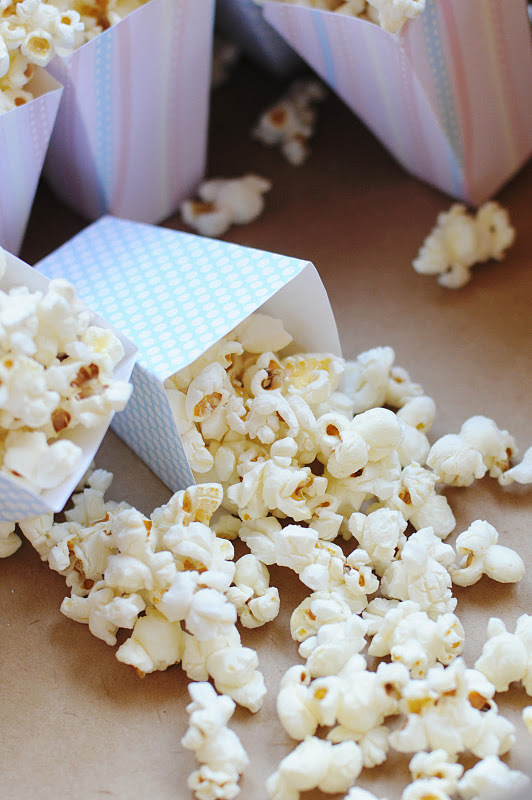 This party is full of inspiration and is definitely a must see. All the party elements had so much thought put into them. Simply gorgeous, Suzanne! I'm so glad that we are cyber friends. Thanks for your submission! 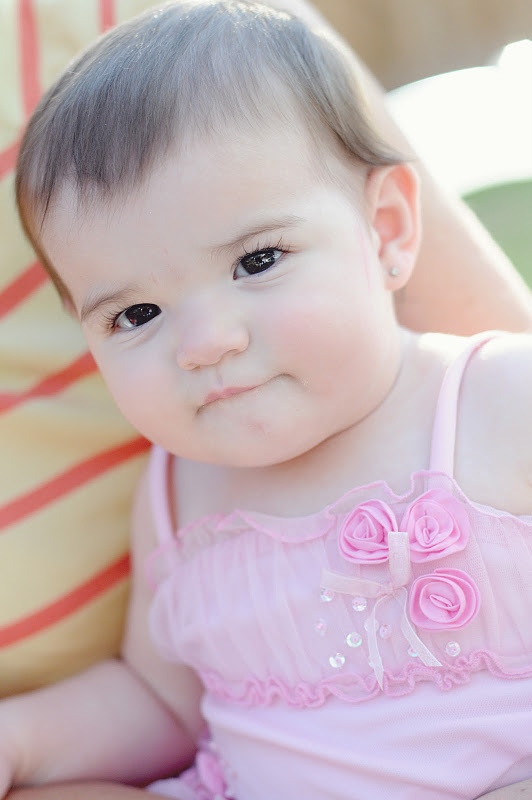 Here is what Suzanne said about the party- "We recently did my daughter’s 1st birthday! After changing my mind several times and settling on a theme, I finally decided to go with a “Ribbons and Bows” because it seemed like a really sweet theme and also because it incorporated something frilly, girly and fun, exactly what little girls are! The invitation and the theme became realized when my sweet friend Kori from Paper and Pigatils helped me design and come with a sweet and girly invitation. 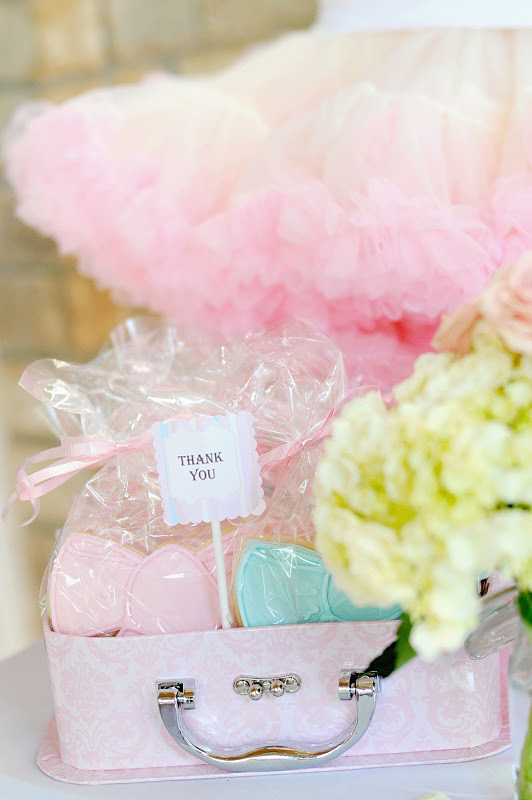 She used bows, tassles, and bunting to give it a taste of girly and sweet! 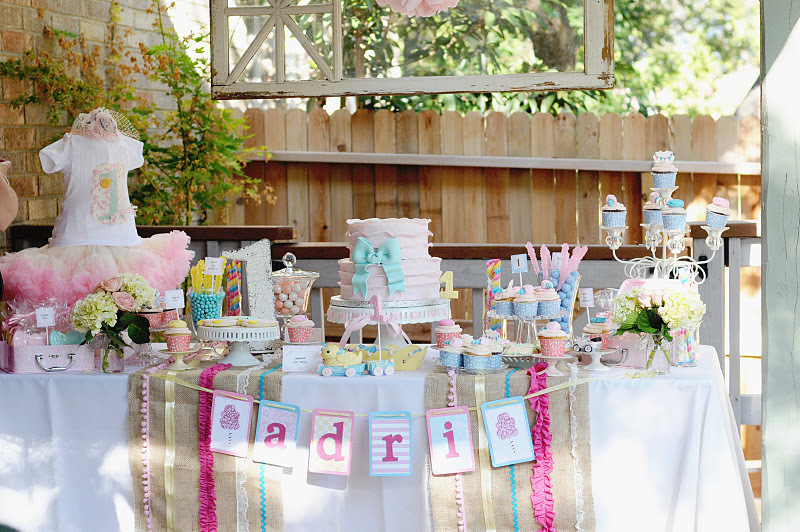 The colors we chose were the soft pinks, soft turquoise and touches of yellow. A sweet color combination to say the least! We did the party in the middle of the afternoon so we went with finger sandwiches, donuts, pop corn, and lots of sweet desserts of course! 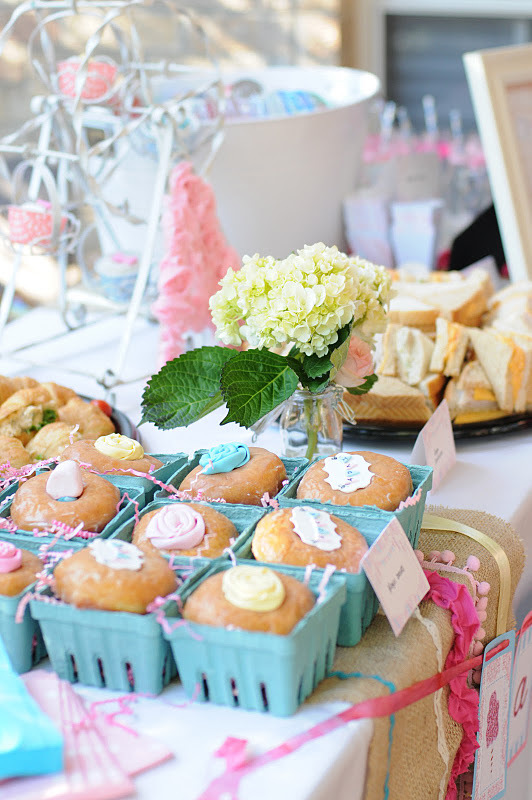 We placed the donuts, powdered donuts and the cupcakes, in pretty snack cups, berry baskets from Shop Sweet Lulu. We also had sweet cookies from The Cookie Jar that tied in beautifully with our theme. 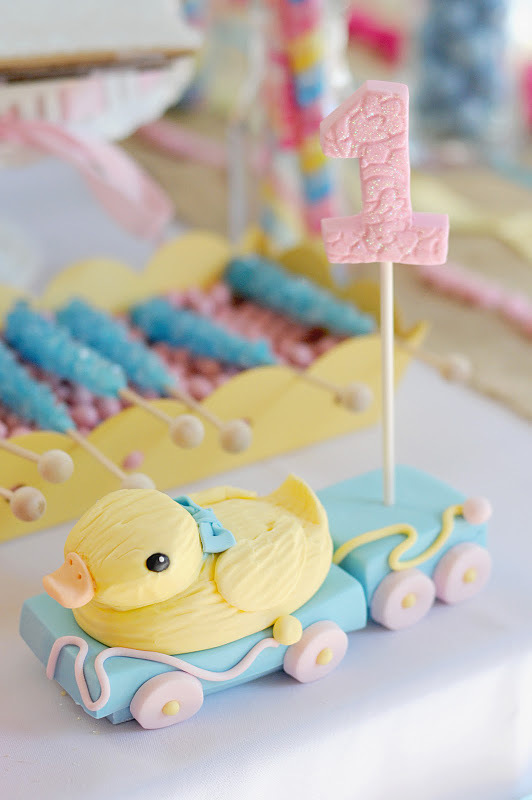 The adorable fondant toppers were made by Brittany from Editable Details...she also made the most adorable little duckie pull toy pulling a number 1 to decorate our table. 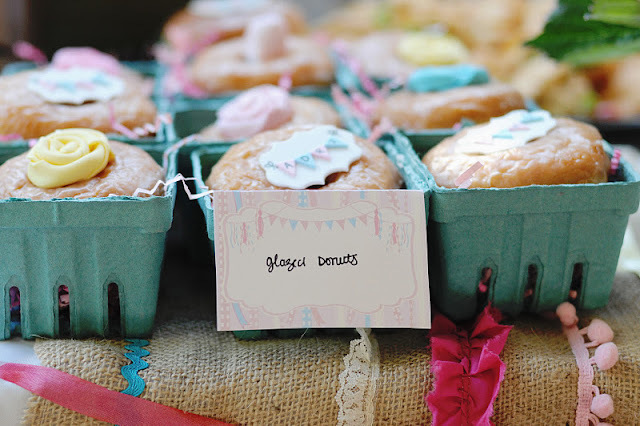 We decided that donuts could use a little decor themselves so we dressed them and they looked absolutely adorable. 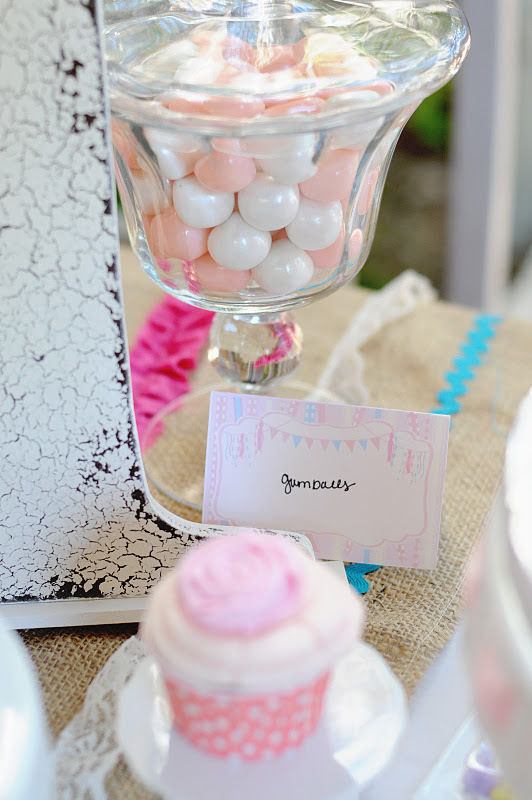 We had assorted candy such as sixlets, rock candy and gumballs that were in our themed colors. Our gorgeous cake was made by Cupcake Couture. We decided to go with 2 two-tier ruffled cake to mimic the ruffles of little girls pettiskirts and dresses and decided to add a bow for that extra sweetness! It was just dreamy and so pretty! 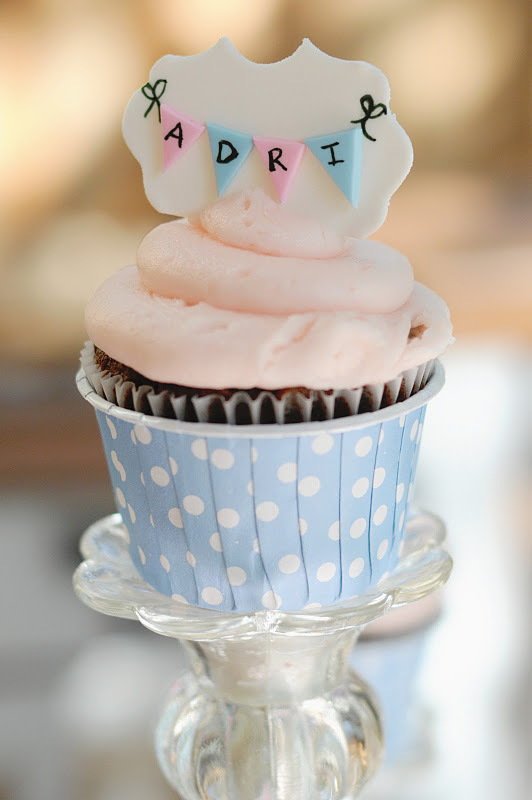 Our cupcakes and adorable little smash cake also came from Cupcake Couture. 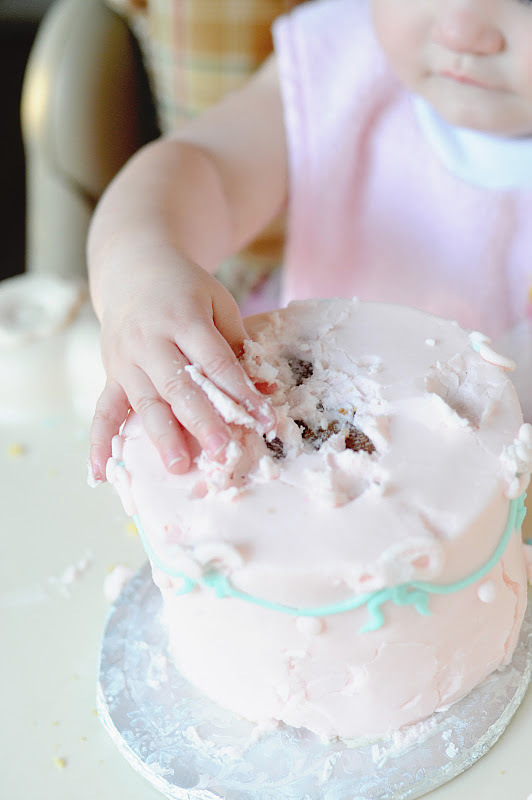 I saw a posting that Rosie from Sweetapolita, she made a sweet little cake for her daughter and I loved it so much that knew that was what I wanted my daughter to have as “her” smash cake. 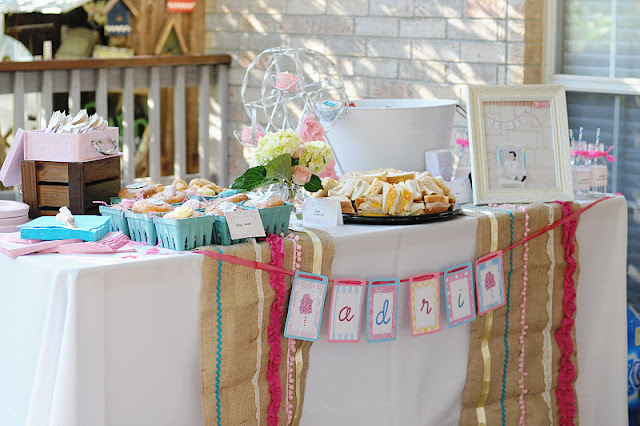 The dessert table looked so quaint, whimsical, sweet and girly! For the decor we decided to add some vintage flair. I enlisted the help from the wonderful and sweet Carolyn from Sweet Tea and Linen, she made burlap runners with ribbons going down across the runners to give it that mix between the sweetness of the ribbons and the look of vintage. 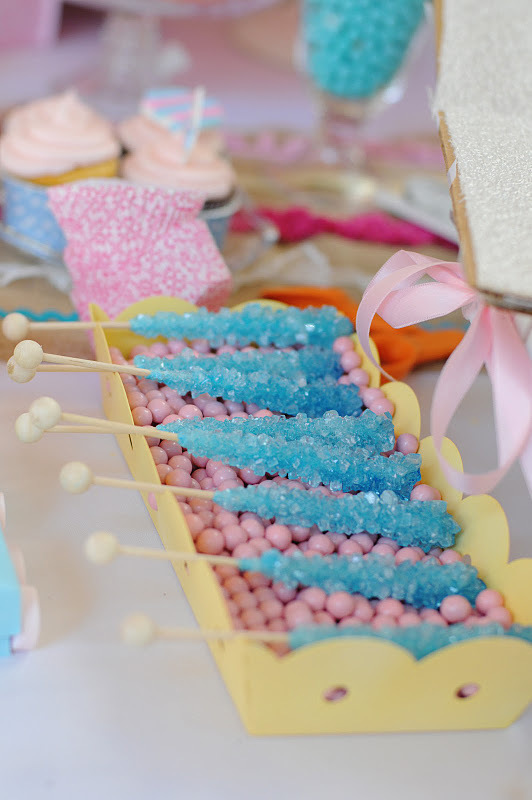 We had our candy displayed in varying apothecary jars and also we got this vintage yellow tray from Kara’s Party Ideas that displayed our eye catching blue rock candy. Of course how could we not have banners with a touch of glitter and sparkle? Kristy from The Purple Pug made the amazing banners with the right touch and amount and glitter. They added so much to our tables. 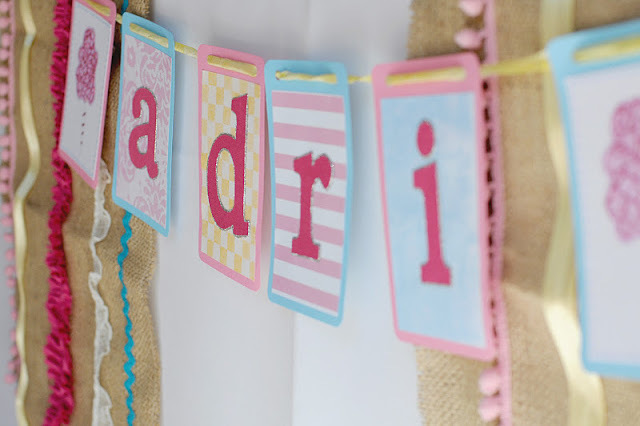 We also got a vintage looking bunting banner from Starlit Nest that we used to hang our over the year gallery on. 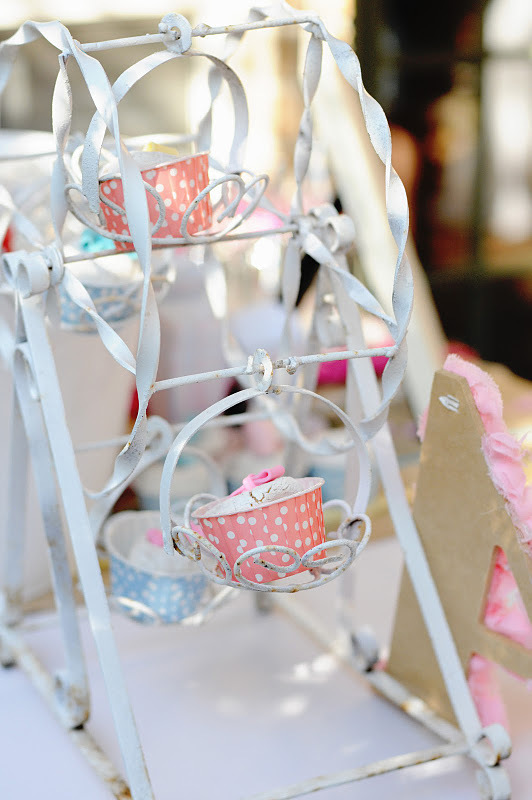 I found some adorable little mini suitcases that we displayed our bow shaped cookie favors from Polka Dot Market, they were looked so sweet on our tables and also held the utensils from Shop Sweet Lulu. 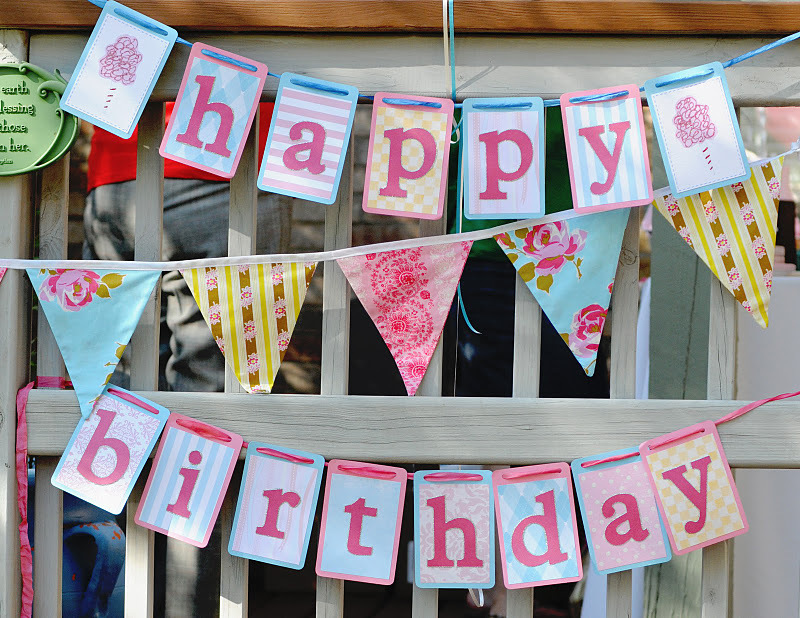 We also bought our polka dot balloons & bunting banners from Polka Dot Market. 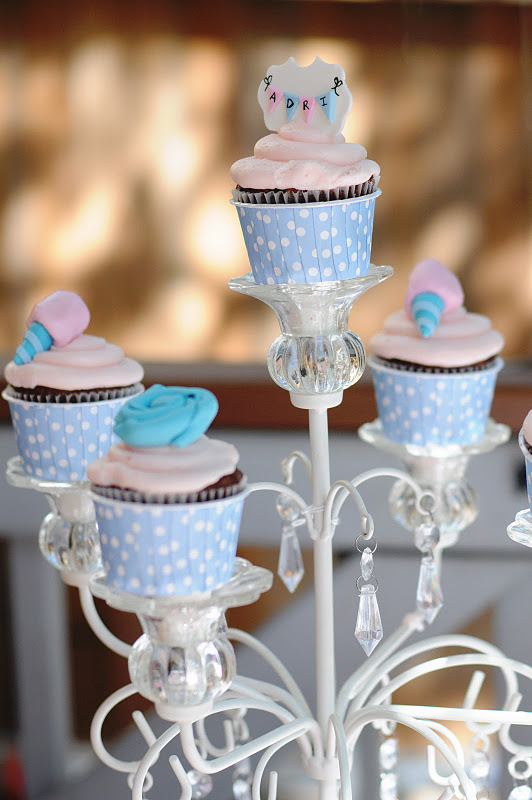 The best little decor that we bought from Polka Dot Market were this sweet little pedestals that we used and placed cupcakes throughout our dessert table. We found this really cool antique looking candelabra that we displayed our cupcakes on and found this cool looking window at an antique store that we hung above the dessert tables with poms from Pom Flair. I found the lace umbrellas or parasols on Chasing Fireflies! I also had a dress form with an adorable top from Oh Fiddlesticks! 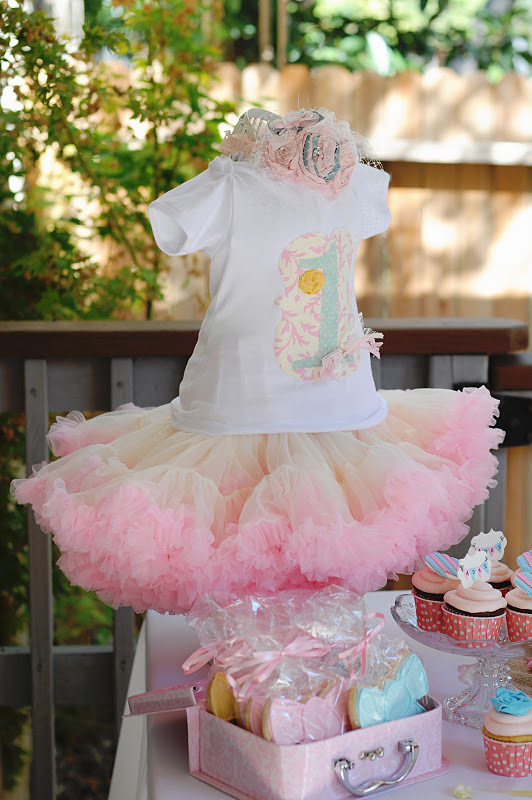 Melissa designed the sweetest and cutest 1st birthday top. It had all the elements that tied into our theme. I decided to to use it as part of the decor because it was so cute and I didn’t want my daughter to ruin it. I made a rosette decorated initial to add to the decor as well as this ferris wheel that had some of the powdered donuts on each “swing” We really tried to make this as frilly, girly, sweet, and vintage as we possible could and I think we accomplished that!" Suzanne, you did such a darling job on this party! Every detail is so sweet! gosh, what a gorgeous party! I can't stop looking at all the details! kudos! 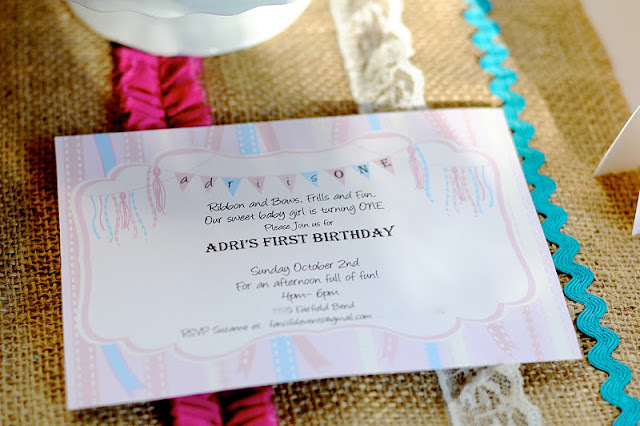 what an adorable invite, party and baby girl! Too cute! 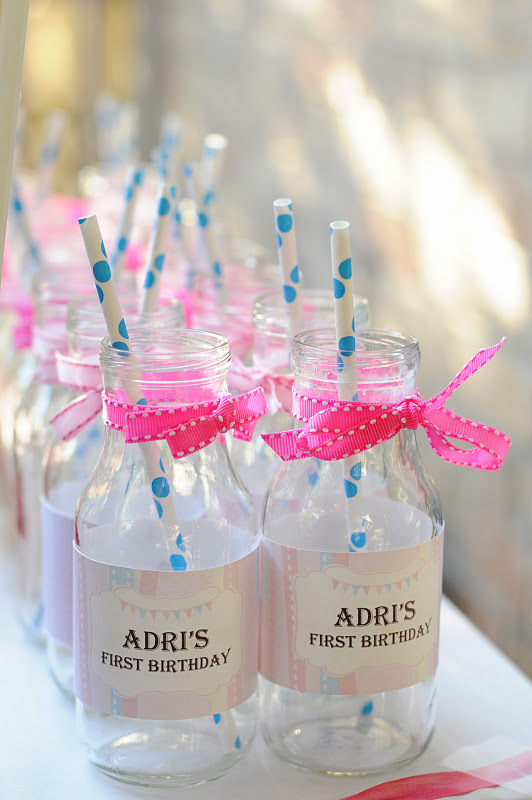 Love the pink and aqua. Im doing the same color scheme for my baby's 1st next week. This baby looks like mine too!! LOL!! I love love love this party! It's so beautiful!